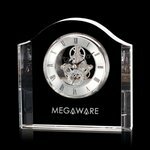 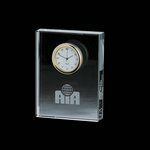 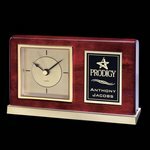 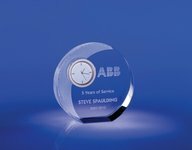 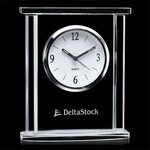 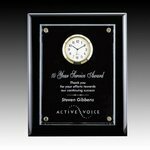 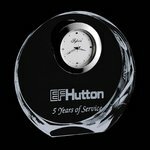 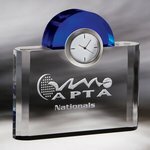 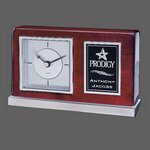 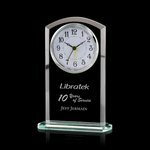 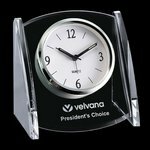 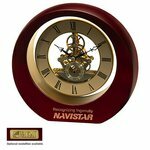 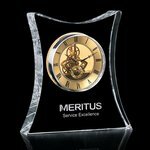 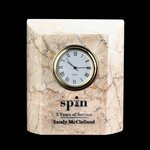 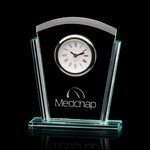 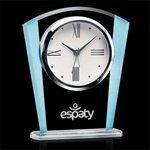 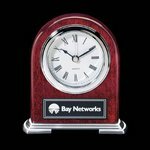 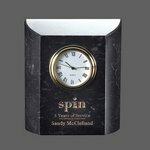 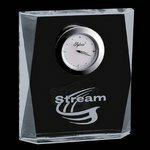 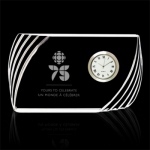 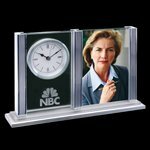 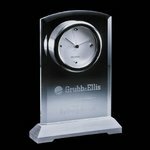 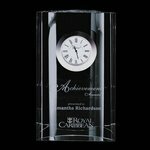 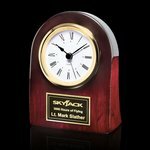 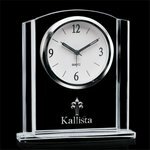 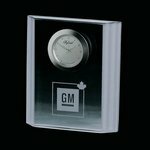 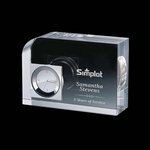 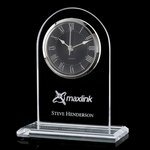 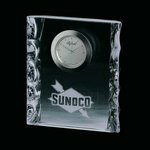 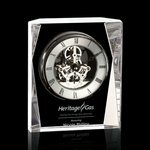 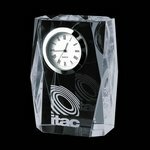 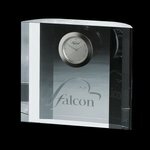 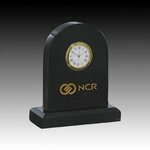 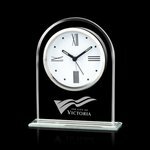 Desk Clocks that can be personalized with your company logo-There is no need to reinvent the wheel every time you give a gift. 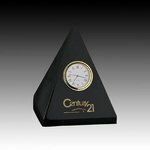 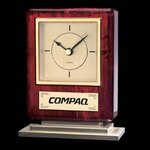 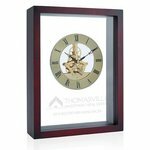 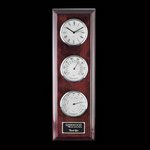 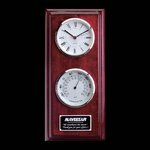 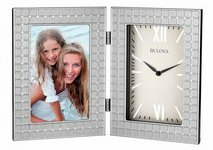 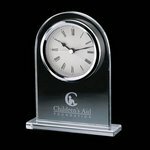 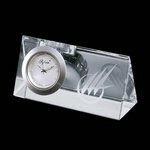 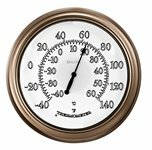 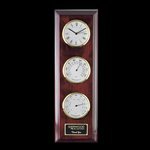 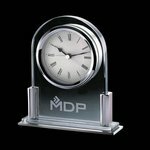 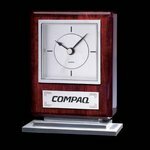 With our continuity products, you can choose from a family of fine custom desk clocks, mantel clocks and wall clocks that will complement each other beautifully in any setting. 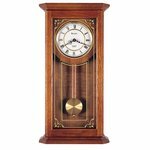 Hammond Clock - Rosewood 9 in.x12 in. 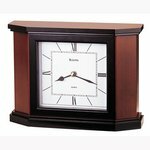 Hammond Clock - Black 9 in.x12 in. 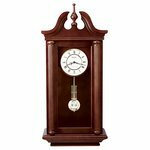 Heath Clock - Rosewood 6 in.x5 in. 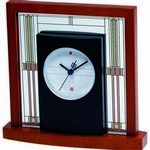 Harvard Clock - Optical 8 in. 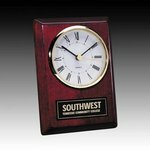 Hammond Clock - Rosewood 8 in.x10 in. 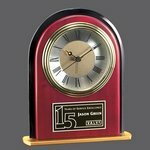 Hammond Clock - Black 8 in.x10 in. 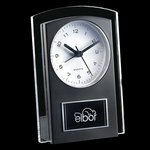 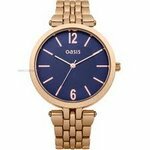 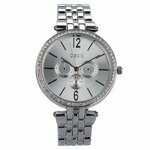 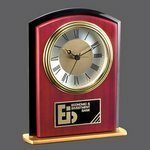 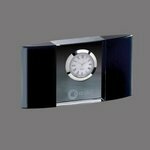 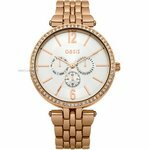 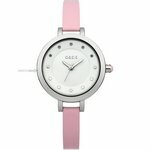 Ellesworth Clock - Optical Crystal 6 in. 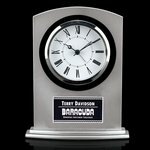 Baldwin Clock - Optical 7 in. 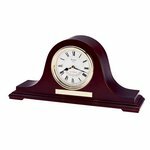 Hammond Clock - Rosewood 7 in.x9 in. 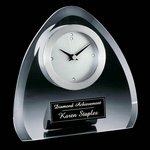 Hammond Clock - Black 7 in.x9 in. 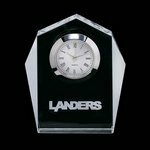 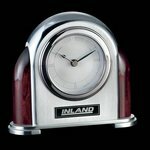 Blanchard Clock - Black/Chrome 6 in. 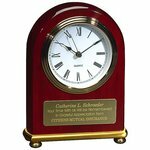 Baldwin Clock - Optical 6 in. 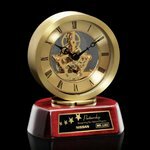 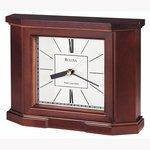 Richelieu Mantle Clock - Burlwood 7 in. 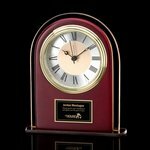 Newtonbrook Clock - Aluminum/Rosewood 5 in. 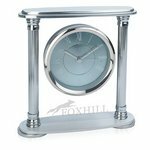 Thornbury Mantle Clock - Aluminum and Glass 7.5 in. 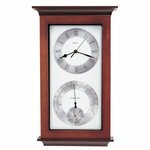 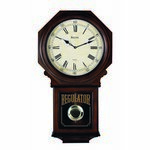 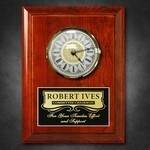 Regency Clock (2 Face) - Rosewood 7.5 in. 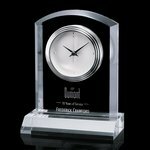 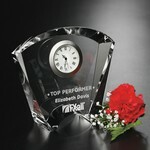 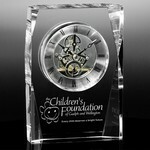 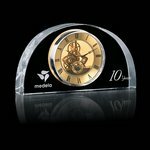 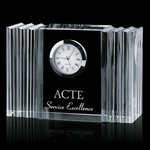 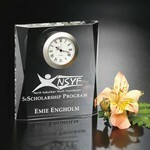 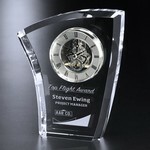 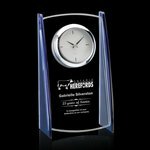 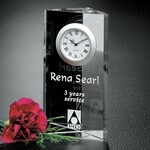 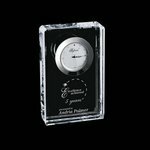 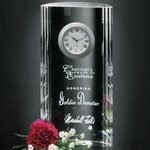 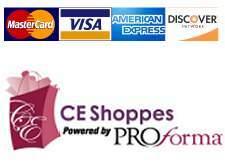 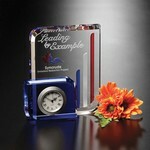 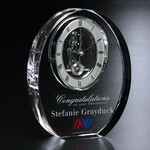 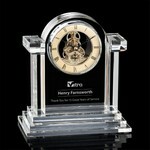 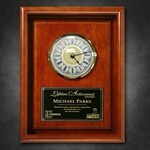 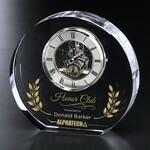 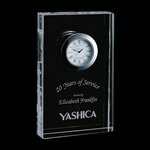 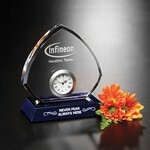 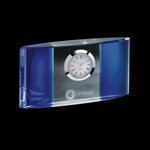 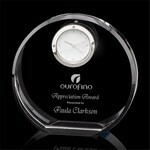 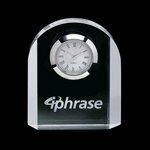 Fanfare Optical Crystal Clock 4-1/2 in. 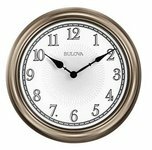 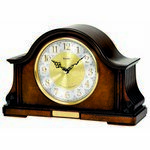 Doulton Clock - Burlwood 7 in. 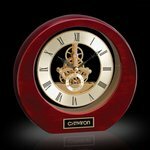 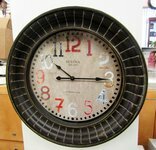 Graydon Clock - Optical 4.5 in. 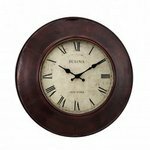 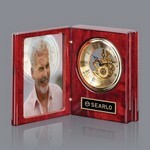 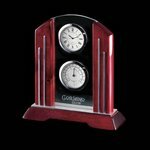 Catarina Clock - Rosewood 8in. 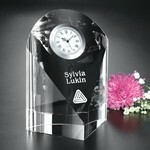 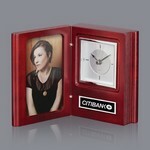 Catarina Clock - Black 8in. 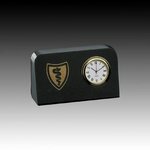 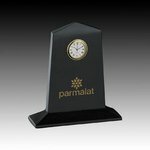 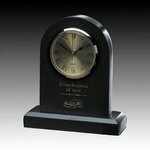 Putman Clock - Black/Aluminum 7-7/8 in. 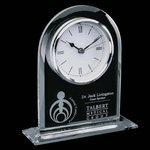 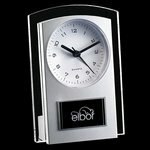 Tilden Clock - Black/Aluminum 7.25 in. 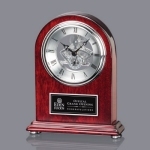 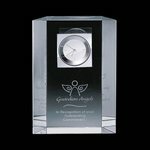 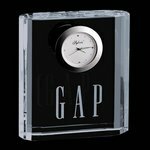 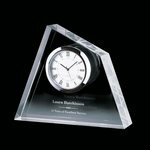 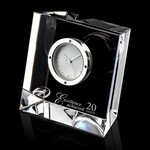 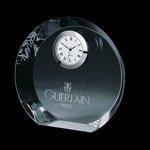 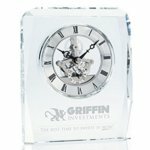 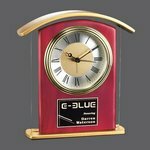 Glencairn Clock - Optical Crystal 4.5 in. 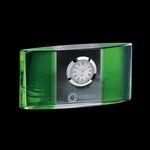 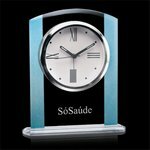 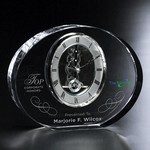 Jade Wave Clock 4-1/2 in. 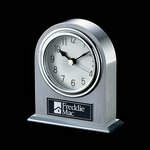 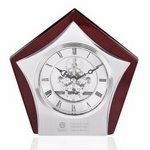 Keswick Clock - Optical Crystal 4.25 in. 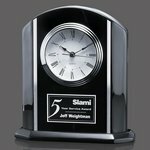 Wickham Clock - Black/Aluminum 6.5 in. 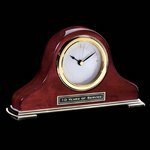 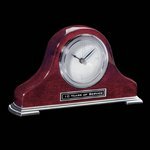 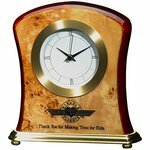 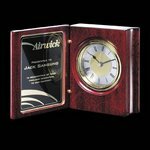 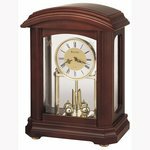 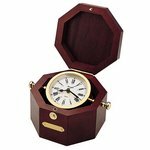 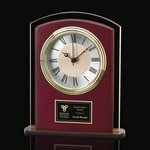 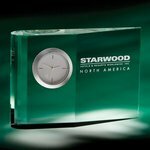 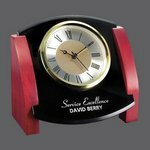 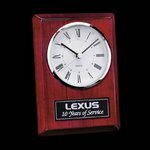 Academy Clock - Rosewood 5.5 in. 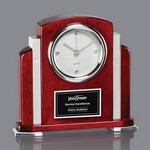 Jordan Clock - Aluminum Base 8.5 in. 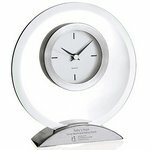 Flint Clock - Grey/Aluminum 7 in. 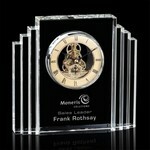 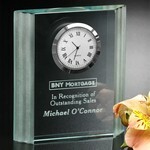 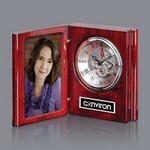 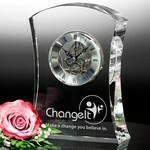 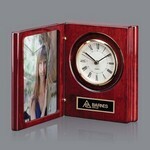 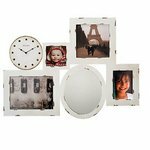 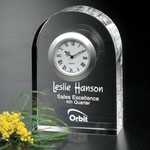 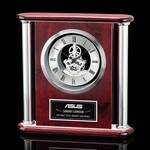 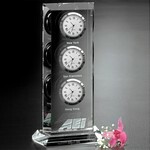 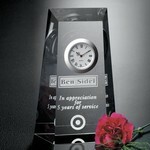 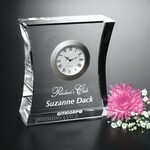 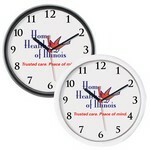 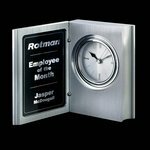 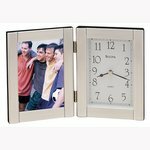 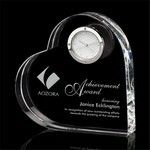 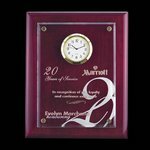 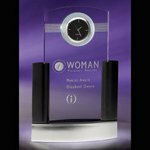 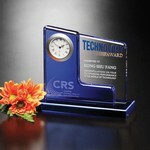 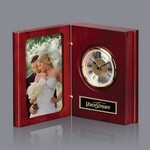 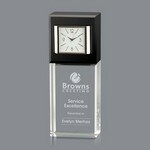 Moments Beveled Clock 4-1/2 in. 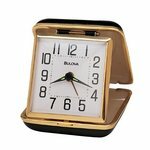 Billingham Clock - Starfire/Blue 8 in. 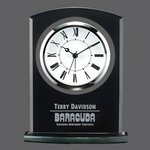 Carnaby Clock - 7 in. 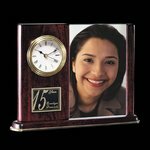 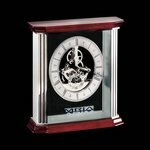 Dodsworth Frame Clock - Aluminum 8.5 in. 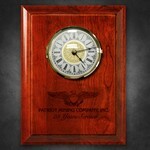 Bristol Clock - Jade 7.5 in. 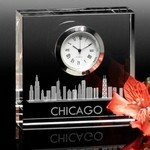 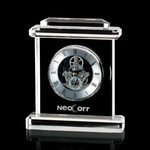 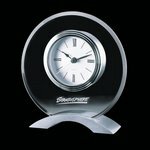 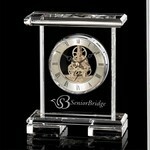 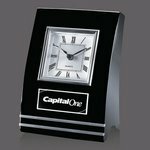 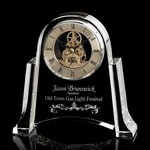 Newbridge Clock - Optical Crystal 3.5 in. 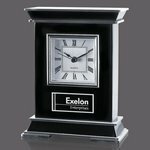 Sutton Clock - Optical 3.5 in. 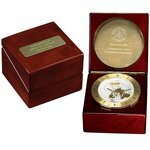 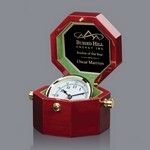 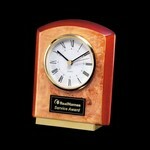 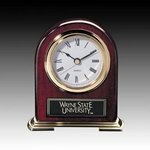 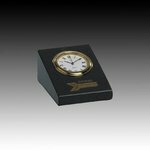 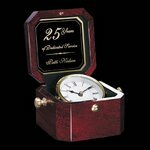 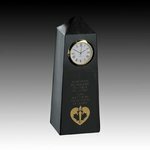 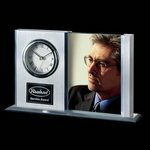 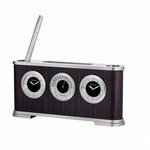 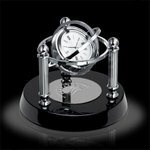 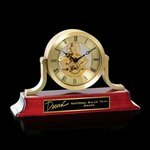 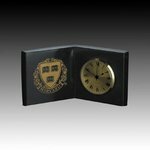 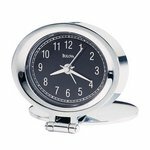 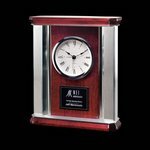 Dodsworth Book Clock - Alumunim 4.5 in. 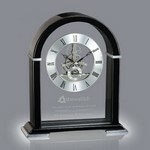 Adelaide Clock - Optical 3.5 in. 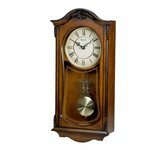 Pitfield Clock - Burlwood 5 in. 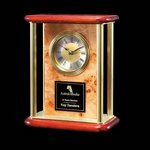 Springfield Clock - 6.5 in. 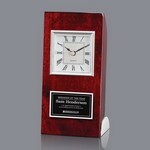 Picadilly Clock - Aluminum Base 7 in. 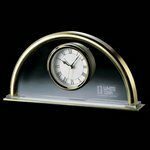 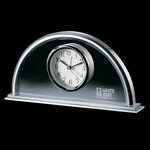 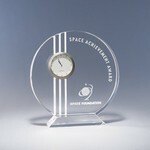 Dodsworth Arch Clock - Aluminum 3.5 in. 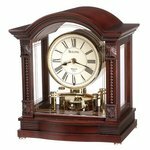 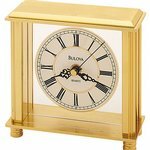 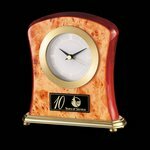 Telson Clock - Burlwood 6 in. 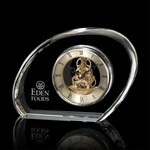 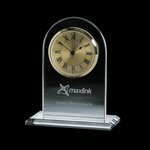 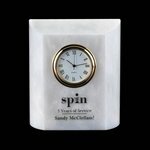 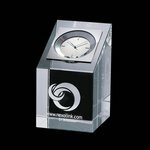 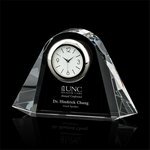 Menkes Clock - Optical Crytal 4.5 in.x3 in. 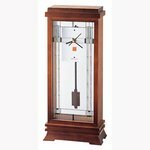 Adriana Clock - Sepia/Rosewood 6?in. 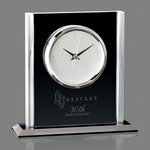 Maresol Clock - Aluminum 6?in. 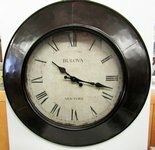 Rhonda Clock - Sepia/Rosewood 6?in. 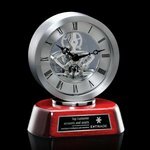 Carreno Clock - Aluminum 6?in. 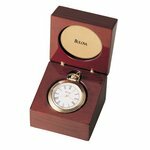 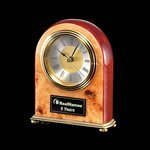 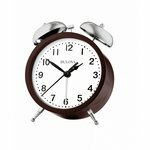 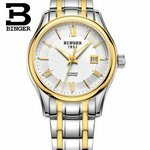 Illovo Clock - Rosewood/Clear/Gold 6.5 in. 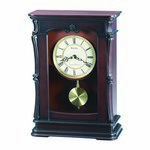 Minto Clock - Rosewood/Black/Gold 6.5 in. 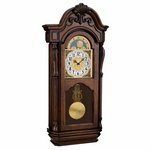 Keele Clock - Rosewood/Black/Gold 6.5 in. 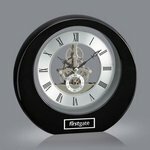 Whitby Clock - Black/Clear 6.25 in. 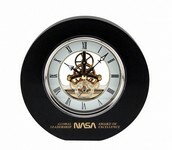 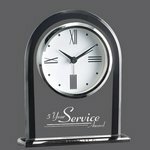 Tuxedo Clock - Black 7 in. 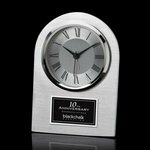 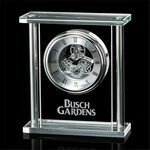 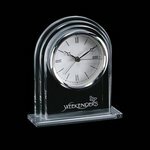 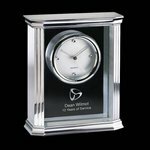 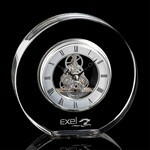 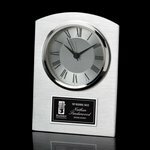 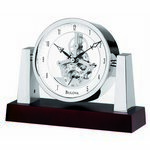 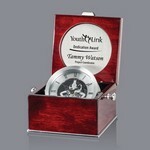 Tuxedo Clock - Silver 7 in. 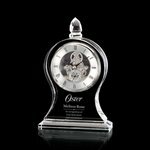 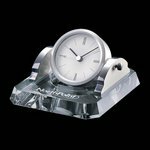 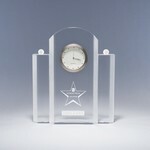 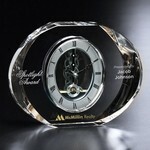 Mallory Clock - Silver/Clear 5.5 in. 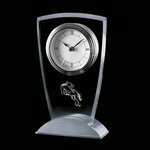 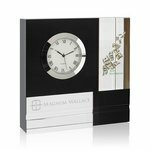 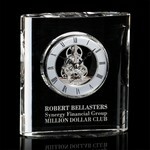 Mallory Clock - Black/Clear 5.5 in.